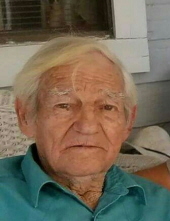 Mr. Thomas Leon Reeves, age 85 of McGrady passed away Sunday, February 3, 2019 at Forsyth Medical Center. Services were held Monday, February 4, 2019 at Stony Fork Baptist Church. Mr. Reeves was born August 5, 1933 in Tampa, FL to William John and Geneva Pelham Reeves. He was a member of Stony Fork Baptist Church and served in the United States Navy. He was a retired truck driver. He was preceded in death by his parents and his wife; Geneva Reeves. He is survived by two sons; Fred Reeves of Zephyrhills, FL and Brent Reeves and wife Michelle of Floral City, FL, four step-daughters; Freda Cox and husband Richard of McGrady, Sandra Miller and husband Casey of Deep Gap, Lesia Sanwald and husband Mark of Taylorsville and Smiley Greene and husband Mike of Deep Gap, eighteen grandchildren, twenty-eight great grandchildren and one brother; Julian Cross of Zephyrhills, FL. To send flowers or a remembrance gift to the family of Thomas Reeves, please visit our Tribute Store. "Email Address" would like to share the life celebration of Thomas Reeves. Click on the "link" to go to share a favorite memory or leave a condolence message for the family.